We enhance public safety and meet the evolving needs of our communities through education, prevention, and emergency response. OCFA Every member of the Orange County Fire Authority contributes to the quality of life within our community. We protect and support the needs of our "neighbors" to the fullest extent possible while helping and supporting ourselves. We believe in our proud traditions and our dynamic future. Our community respects and values our services and we constantly reinforce that the responsibilities with which we are entrusted are well placed. I would like to welcome you to the OCFA website. We hope that you will find it easy to read and, more importantly, areas that are important to you are readily accessible. A considerable amount of time and research went into how the homepage is structured, from the banner categories and updates, to layout, icons, and photography. As Fire Chief, I thought it appropriate to share with you what is important to me personally, and some points about my expectations, priorities, and the vision for our organization. I believe that leader development is a shared responsibility of the employee and employer. While every organization has some good leaders with natural abilities, there is a big difference between some leaders doing the right things and most leaders doing the right things. For this reason, we will be focusing our attention on building stronger leadership within the OCFA. This includes providing formal leadership development and training at all levels of our organization. I believe that investing in the safety, health, and welfare of our firefighters is a serious obligation and one that is not to be taken lightly. Serving our communities is an important priority; however, if we don’t provide for our employees first, we will not be able to serve at the highest-level possible. To that end, we will make it a priority to ensure that our firefighters continue to be physically and mentally fit for duty. Promoting cultural and ethnic diversity as a strength and increasing the number of women firefighters within the OCFA is one of my top priorities. Diversity is not just about race or gender; it is about leveraging different thoughts and ideas, different skill sets, and different approaches towards solving our problems. Diversity is what makes a team strong; it allows one person’s weaknesses to be offset by another’s strengths, creating a balance. Firefighters are problem solvers; diversity will benefit the OCFA by helping us to more easily fulfill our mission in serving our communities. Also important to me is our becoming a more “Mission-Driven Culture” (MDC). Mission-Driven Culture describes a set of principles for operating successfully despite friction, danger, and uncertainty. It defines key values and attitudes that generate cohesive and adaptive action, strengthening resilience in times of uncertainty. These values include the aggressive pursuit of truth as well as communicating intent to promote decision-making and initiative among those in the field. I believe in an organizational culture that is transparent in its goals, objectives, and decision-making, and that shares information extensively. An organization that has thoughtfully and deliberately pushed decision-making down to the lowest possible level is much more agile, creative, and effective than organizations that are led in a traditional top-down manner. My vision for the OCFA includes that we are the most progressive 21st century fire service organization in the United States. An organization known for its cohesion, adaptiveness, and resilience. The key to this success is through vision, trust, and a deep sense of purpose. I am extremely proud and humbled to have the opportunity and privilege to serve as the Orange County Fire Authority (OCFA) Fire Chief. Prior to May, 1980, fire service for the cities of Cypress, Irvine, La Palma, Los Alamitos, Placentia, San Juan Capistrano, Tustin, Villa Park, and Yorba Linda along with the County unincorporated areas was provided by the California Department of Forestry (CDF)*. However, on May 16, 1980, the Orange County Fire Department (OCFD) was formed as a county department reporting to the Board of Supervisors. Its fire chief was Larry Holms. Fifty-two percent of the 518,483 residents served by the OCFD lived in unincorporated areas of the County. Nevertheless, the dream did not die and the momentum was soon recaptured. A new governance structure, a Joint Powers Authority (JPA), was selected. Much of the previous work was used in this endeavor. By 1994 the plans and structure of the new agency were well underway. The County Board of Supervisors, the various City Councils, the OCFD labor groups, and management were all pulling together to launch the new JPA. Then on December 6, 1994, the County of Orange declared bankruptcy. 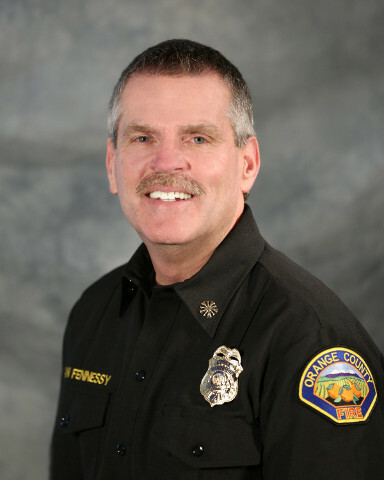 Yet, in spite of this almost insurmountable obstacle, the dreams and plans were brought to fruition and the Orange County Fire Authority (OCFA), under Interim Fire Chief Ken Mcleod, was formed on March 1, 1995. The County bankruptcy, which was merely coincidental to the JPA formation, had not derailed the efforts. 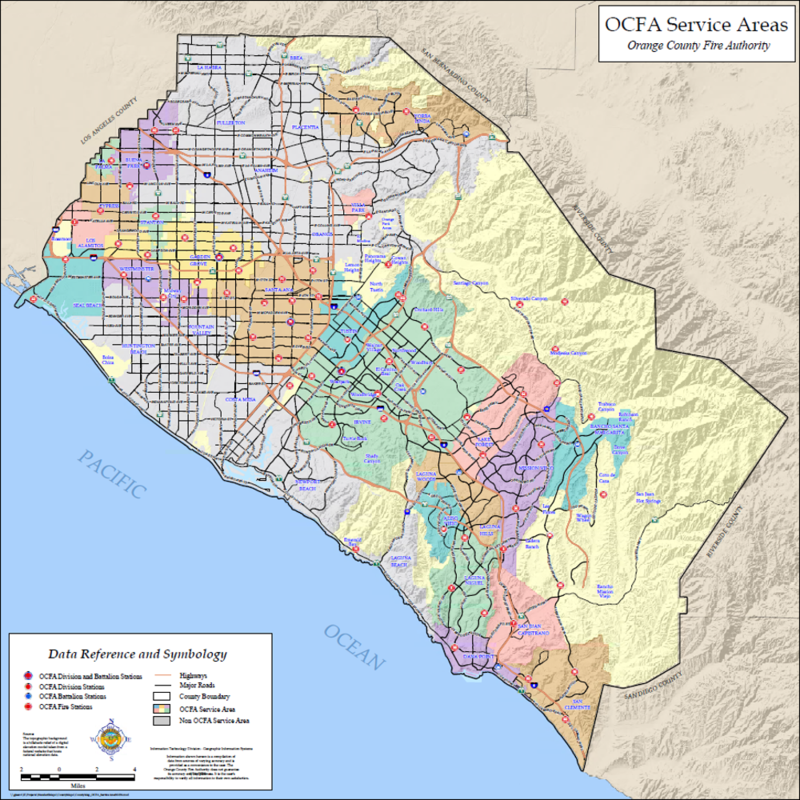 * - In 1980, the cities of Anaheim, Brea, Buena Park, Costa Mesa, Fountain Valley, Fullerton, Garden Grove, Huntington Beach, Laguna Beach, La Habra, Newport Beach, Orange, San Clemente, Santa Ana, Seal Beach, Stanton, and Westminster had their own municipal fire departments. Since then, Buena Park, San Clemente, Santa Ana, Seal Beach, Stanton, and Westminster joined the OCFD/OCFA.